For so long it’s on my mind that which publishing platform should i choose from Wordpress or blogger. I guess you also have same question on your mind when you opt any of the platform to start with. 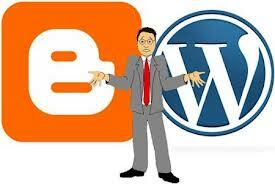 Today I am going to clear up all the doubts about both Blogger and Wordpress in this article. Blogger Provide the best platform and by far the most simple and liked platform from over a million of people all over the world. Why it is so, because it’s easy to start with no need of being any technical expert. Secondly, choosing your preferred URL and blog name is also easy. In Blogger it’s all free of cost to use and run for a as long as you want. You are totally free if you want to buy a domain name like yoursite.com or work with the yoursite.blogspot.com . Keep in mind that using blogspot.com takes much time to get ranked in Alexa or Getting its Google Page Rank than the .com domain. For blogger there are many widget coding available on the internet. You can use any of them to make your blog as you like it to be. A word of Advice: Don’t Add Many widget coding this will harm your page rank. As the name say free this is a totally free. There are over 120 free themes to choose from. You can Add Premium themes after paying for them(just for the themes nothing else free themes are free). The best part new options are added every week to work with. Free Wordpress allows you a 3GB Space for Picture but no Video space. .com , .net , .org , or .me any one you like. You can change link colors ,font and modify CSS. Beside Premium package you will not get any premium themes you still have to pay for them but 120 free themes to choose from option is still on. In the Business Package you will get Domain as same as of Premium .com, .net, .org as you like. Modify your CSS and font etc. You get the option to Choose 120 Free themes and 50 Premium themes ( Yes this Package include 50 Premium Themes) And if you want more you have to pay from them. The Best thing you get unlimited storage for uploading from vides to picture. Chat Support and Direct mail provided. Good article, I started out with blogger, but the problem is I think more people believe that the blogger sites are more for amateurs. If you want to be taken seriously wordpress themes look more professional.